Have you ever judged a neighborhood by its trees? I have. Without even realizing it, I've felt happy walking down an alley of green trees in the summer, in the filtered light of their giant canopies. I've also felt that a block is gloomy or deserted before noticing what makes it that way: the dead, barren pavement with no trees. It's not just your imagination if you can relate. Studies have shown that a higher number of neighborhood trees is correlated with increased safety, better schools and more neighbors who know each other’s names, not to mention more shade, less storm water flooding and cleaner air. Coming from sun-scorched Los Angeles, trees were one of the first things I liked about New Haven—how green they are in the summer, how they change to fiery colors in the fall and the stark winter lines of their silhouettes—but I thought they had always been there. I took trees for granted. I knew that better neighborhoods have more trees, but I didn’t know why. I thought that all one could do about this was choose one neighborhood over another. And then I worked with the Urban Resources Initiative (URI). 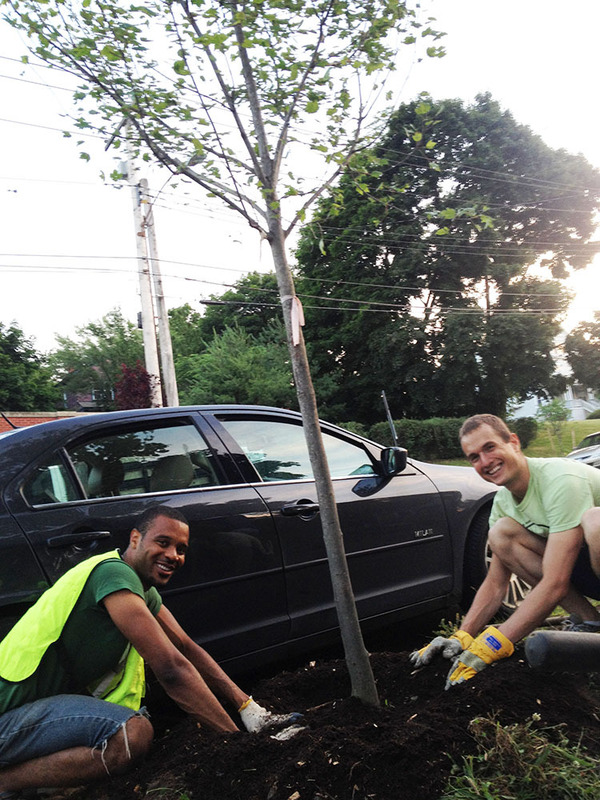 When I became an urban forester with URI I was responsible for helping community groups green their neighborhood by planting flowers in park spaces and road medians, remediating lead-contaminated soil in front yards and planting street trees. 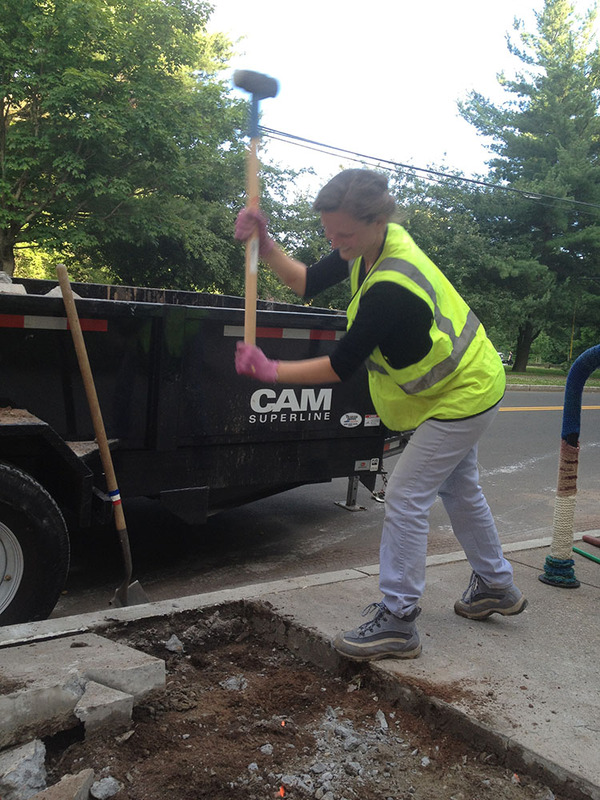 When I met Jessica F., one of the leaders of the Westville Greenspace group of volunteers, I was ready to help, but naive to the projects that lay ahead. Jessica and I met at a Westville café, where she told me the story of how she first decided to plant trees in the neighborhood while walking home one day in pouring rain. She was pregnant at the time, six years ago, and she found herself running from tree to tree for cover. But there weren't enough trees and the rain was soaking her. Instead of blaming the city, bad luck or any factors outside of her control, Jessica decided to plant more trees on her street. She explained, as a casual statement of fact, that with the help of URI and volunteers, her group had planted 75 trees over the five summers since that rainy day. In the same easy-going but determined voice, she told me that "this summer we will plant 25 trees in Westville to reach our 100-tree goal." She showed me a map of Westville Village, the commercial zone bounded by Whalley, Fountain, Harrison and West Rock Avenues. Twenty-five green dots on the map—planting sites—looked like an easy task. The next three months of planting were challenging, sweaty, dirty, fun, surprising, rewarding, and, in short, anything but easy. Unlike the previous 75 trees, which were planted on residential streets, the next 25 were to be planted in the commercial zones of Westville Village. Business owners are typically less receptive than homeowners to taking on the responsibility of watering a tree. Chris H., the executive director of The Westville Village Renaissance Alliance (WVRA), partnered with Jessica to talk to the various merchants. Together with Debby E., the new co-chair of the Westville Community Greenspace Group, they spoke in person to owners of art galleries, stores and restaurants about how trees would make Westville even more welcoming to pedestrians. Not only did most business owners approve, but many of them made significant contributions to the tree planting and stewardship efforts. A conversation with Mr. C., the owner of a local restaurant, stands out in my mind. He said that after storms and heavy flooding destroyed the streets of New Haven in 1985 new trees were planted all along the street, but he refused to receive a tree in front of his restaurant. 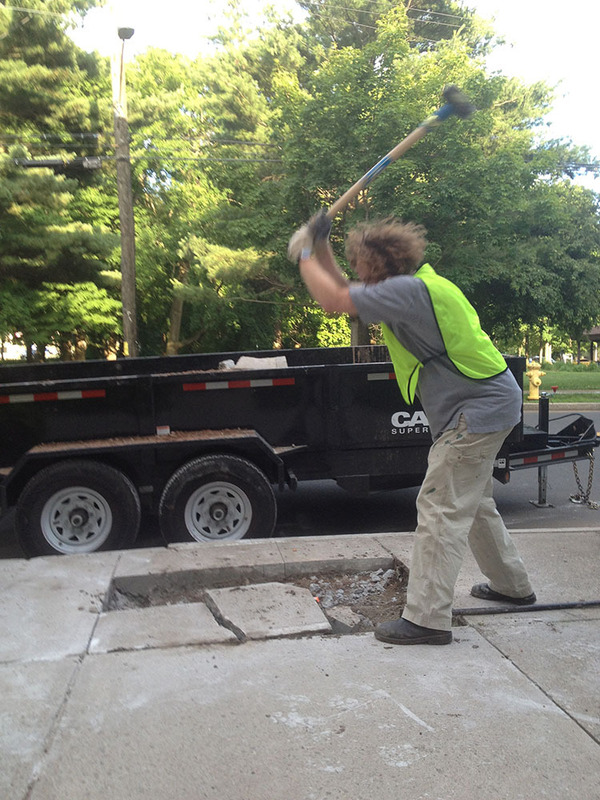 “I insisted,” he said, “and now, over 25 years later, the only straight piece of sidewalk is in front of my building,” he said pointing to the cracked and lifted chunks of cement all along the street. Indeed, the Honey Locust trees planted a quarter century ago have grown so large that they became a problem for narrow planting strips and power lines. I explained that a lot has been learned over the years, and that URI chooses appropriate trees for each location. 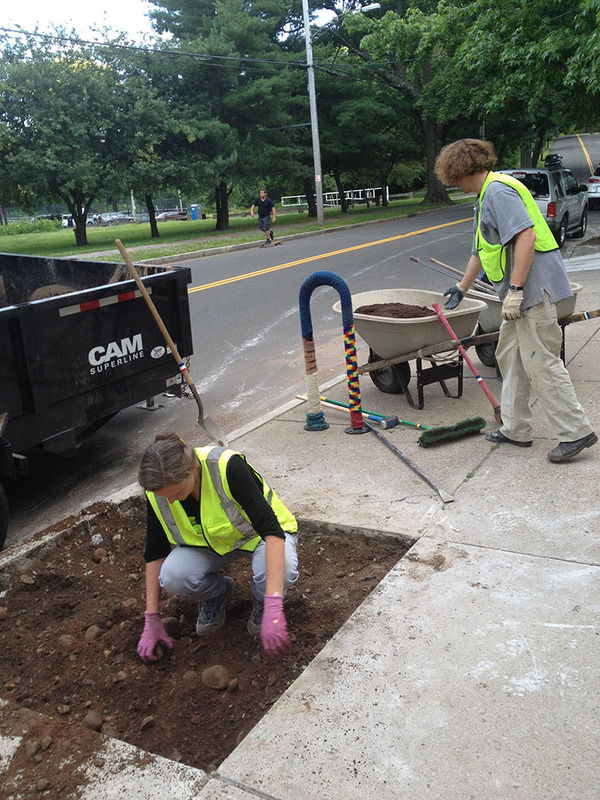 Oaks, Red Maples, and other large trees can be planted in open areas, but in front of his restaurant we offered to plant a small tree whose roots and canopy will not threaten sidewalks or power lines even at full maturity. Mr. C. agreed to have two trees planted, a purple-leafed Thundercloud Plum and a red-leafed Forest Pansy Redbud, whose heart-shaped leaves matched in color Mr. C's overhanging awning. As Mr. C. offered water to volunteers during the planting outside his restaurant, I realized it was a historic moment for him and the Westville community. We continued to plant trees in front of all different types of establishments: a firehouse, a nursery school, a doctor’s office. As the summer went on, close to 200 hours were donated by volunteers. At the end, the planting of the 100th tree called for a celebration, attended by many community members and New Haven’s mayor, John DeStefano. “We, as a community,” said Jessica at the beginning of her speech, “have planted and cared for 100 trees.” She recounted cutting and breaking concrete in some areas and removing brick pavers, by hand, from seven sites in order to make new tree pits. This hard work—cleverly termed “sweat equity” among URI volunteers—pays off in much needed shade, enhanced sense of community and slower, safer traffic. In hard numbers, Jessica estimated that 100 trees provide the benefit of 40,000 avoided gallons of storm water runoff, 2,500 kilowatt-hours of electricity conserved from natural cooling and a 9,000 pound reduction in atmospheric carbon emissions this year alone. The benefits will only increase with time. In her speech, Jessica proceeded to thank the staff of URI, who have “always been the guiding force for this tremendous good.” She went on to thank me, her intern, and URI’s funders and supporters, including The City of New Haven, The Community Foundation for Greater New Haven, Yale Office of New Haven and State Affairs and the United Illuminating Company. Jessica did not ever mention in her speech that she is a doctor-anesthesiologist, a wife and a mother of two young children, with a house and a dog to keep her busy. Nonetheless, she took it upon herself to transform her neighborhood for the better, and she did an astounding job. The common effort she started has not only helped plant trees, but has nurtured bonds between neighbors who may not have otherwise met each other. Maybe that’s why neighborhoods with more trees are safer and friendlier places to live. I look at the work done by Jessica and the Westville Greenspace group as an inspiring example: The community is safer, more beautiful and one no longer needs to sprint between trees to stay dry in the rain. - Story written by Alisa M., 2012 graduate of the Yale School of Forestry & Environmental Studies. Adapted from Urban Resource Initiative’s Urban Issues, Fall 2012, Vol. 23, No. 2.